Hand towel made by Adeline Loftin of Denton, NC in 1863. NC Museum of History. Lace detail, hand towel made by Adeline Loftin of Denton, NC in 1863. NC Museum of History. 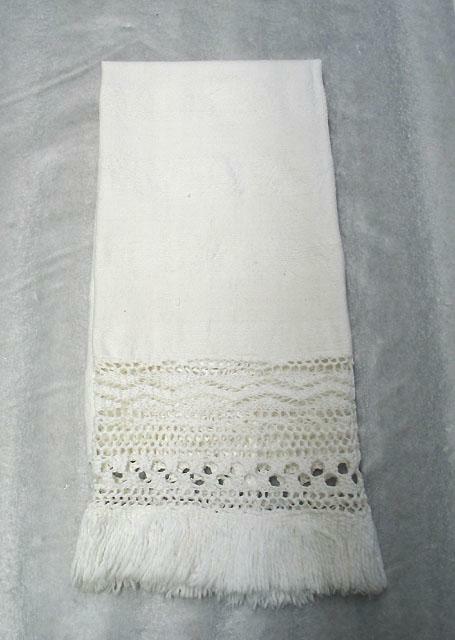 White hand towel with crocheted lace. Family tradition said that the towel was made by Adeline Loftin of Denton, NC in 1863. Ms. Loftin grew the flax, spun the yarn, wove the fabric, and crocheted the lace. Are you sure that edging is crochet? It looks like knit to me, the stitches are pretty clearly defined. It looks like it was knit side to side. Working from the top edge there is a row of faggoting, a variation of a common wave, several more rows of faggoting, some nifty eyelets, and more faggoting. In the photo I can’t see knots at the top of the fringe (maybe just a lack of clarity? 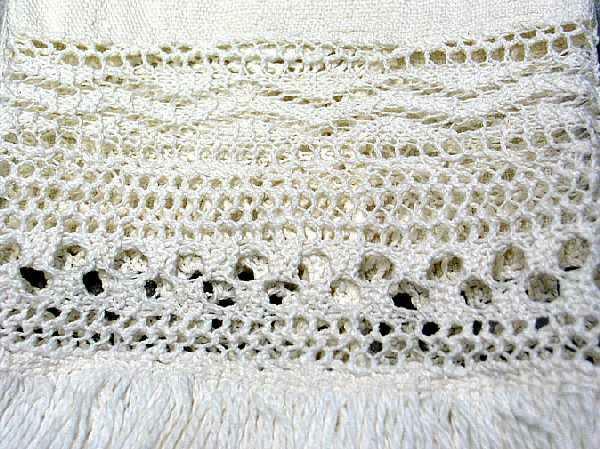 ), if there aren’t knots it’s likely a common knit fringe and maybe knit all in one with the other patterns. Not sure Beth – I didn’t have the opportunity to inspect it myself but, instead, relied on the Curator’s descriptive comments.